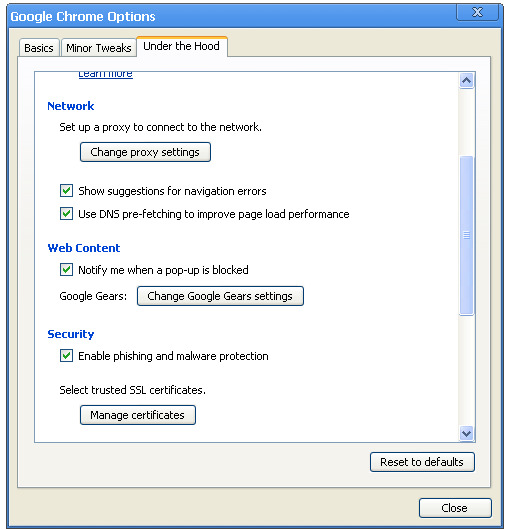 How To Block Pop-Up In Google Chrome ? Whenever we are free-download-google-chrome-browser/">browsing the net, some unwanted pop ups would irritate us often and it spoils the relaxed browsing. To block such pop ups Google Chrome has come out with a feature that can easily block all those annoying pop-ups. When you intend to block the pop ups you will be prompted with a google-chrome-theme-in-firefox-chromifox/">notification. how-to-view-the-pagerank-and-alexa-rank-in-google-chrome/">Follow the following steps to block the Pop-Ups in Google Chrome. •Click on the wrench icon located on the upper right corner of Google Chrome window. •how-to-fix-firefoxexe-error-in-firefox-browser/">Click under the Hood Tab. •Uncheck the Notify me when a Pop-Up is blocked under Web content. •Then click Close and Restart your Chrome browser to how-to-solve-just-in-time-debugging-error-in-windows-start-up/">apply the changes.